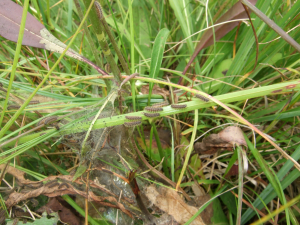 Observation - MARSH FRITILLARY CATERPILLARS ON THE MOVE - UK and Ireland. Description: SMALL BLACK SPINY CATERPILLARS ON DEVILS BIT SCABIOUS ON THE MOVE TO A NEW FOODPLANT.SECOND PHOTO IS OF NEW TENT. CURRENTLY IN HIBERNACULUM. SMALL BLACK SPINY CATERPILLARS ON DEVILS BIT SCABIOUS ON THE MOVE TO A NEW FOODPLANT.SECOND PHOTO IS OF NEW TENT. CURRENTLY IN HIBERNACULUM.